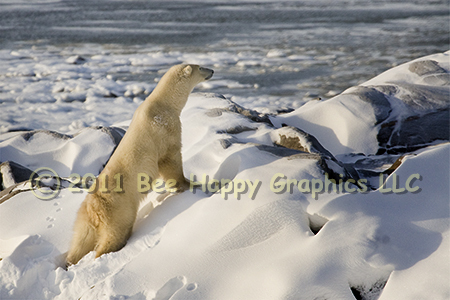 This polar bear appears to be scouting the horizon, impatient for the ice to freeze so it can hunt seals. It hasn’t eaten anything of substance for a couple months. Polar bears are the most carnivorous of all bears. Most of their diet consists of ringed and bearded seals, and they lose weight when they are not on the ice. 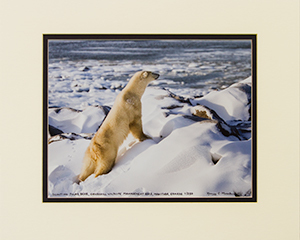 It has been reported that a polar bear can smell a seal twenty miles away. Photographic details: Canon EOS 30D camera w/ EF 100-400mm f/4.5-5.6L IS USM lens set at 400mm. Flash was not used. Camera was set for 1/800 sec on shutter priority with +2/3 stop exposure compensation, resulting in an aperture of f/10 at ISO 400. Fine Art Paper 11" x 14" 12" x 151/2"
Canvas N/A 15" x 19"